"secularists claiming that a three word prayer at the beginning of Bideford Town Council meetings are somehow a breach of their human rights. The Christian Institute has the article here. The council has had this prayer since the time of Elizabeth I, some four hundred years. The prayer is in Latin and goes, 'Domine dirige nos' which translates as 'Lord guide us'. ...if they want to pray they ought to go into another room first. They say that they (the secularists) shouldn't have to leave because they are elected members." "... Well, aren't the others, who want to pray, elected members too? Bizarre!" It strikes me that the author's query is about equality; positing, in subtext (as it seems is so often the case with the religious language) that the idea of adding a prayer to something is the same as not adding a prayer to something! which, for me, are completely opposite concepts. What the religious don't seem to get is the religious and non religious are not equal. There's no need to pity an equal! Do we not only pity those we consider to be in some way less, or less well off, than ourselves? However, from the atheist point of view, the religious are the ones worthy of pity, with their sad addiction to the bronze age dream machine, their lack of, or fear of, knowledge and wilful tormenting of humans who simply 'do not fit' their magic book's criteria. Actually, now I come to think about it, that's really quite loathsome; Kids are dying everyday of hunger and they buy churches for their own gratification and glory; abdicating one's personal responsibility for one's fellow human to the vague hope that some pretend benign grandad will put it all right in the end, disgraceful! But I digress. 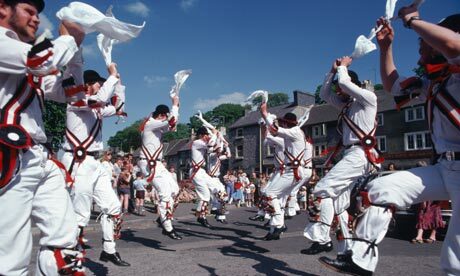 "Morris dancing has a long recorded history in this country(UK), the earliest reference being from 1448." To a non-religious human, or humanist, there is as little (or as much) meaning in the council leader starting each meeting by donning a sash, trouser bells and fancy be-flowered hat to wave a hanky about in a camp manner, as there is in having a prayer! Religious and non-religious people are not being equal; we think differently. Religious apply meaning to that which is merely ritual, tradition or custom. to perform what you considered to be a ludicrous ritual before a meeting? The Devon Humanists group who made the initial complaint have been active against the use of religious ritual in council meetings since at least 2008. "Many councils throughout the UK begin their meetings with prayers, mostly Christian in nature. This surprises many people and has disturbed Devon Humanists for some time."